My table is filled with real and faux candies. 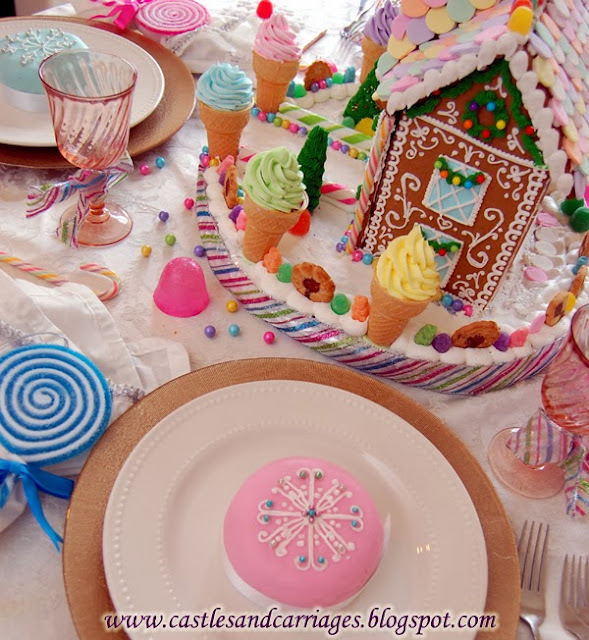 Giant gumdrops, sugared lollipops and candy canes are scattered about the table. Each plate is topped with real chocolate cake. 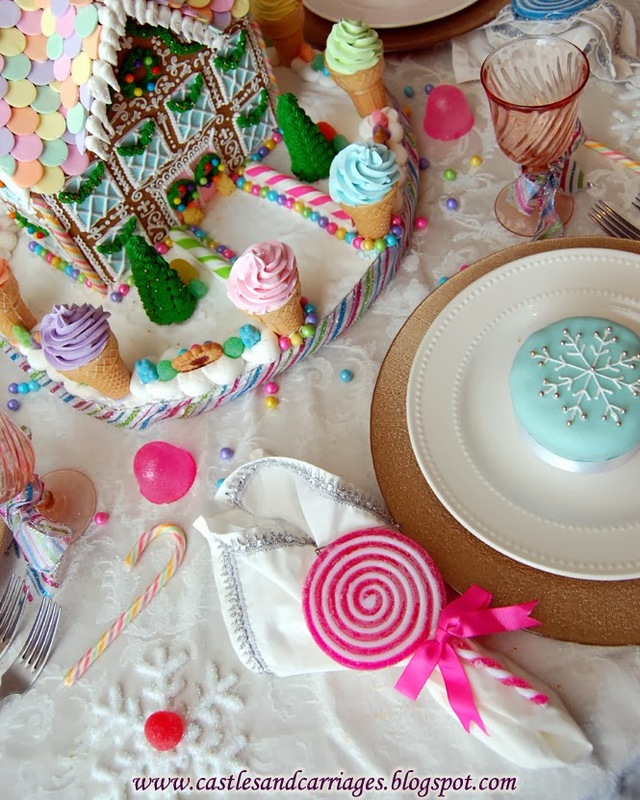 The chocolate cakes are covered with a thin layer of marshmallow fondant, royal icing snowflakes and silver dragees. 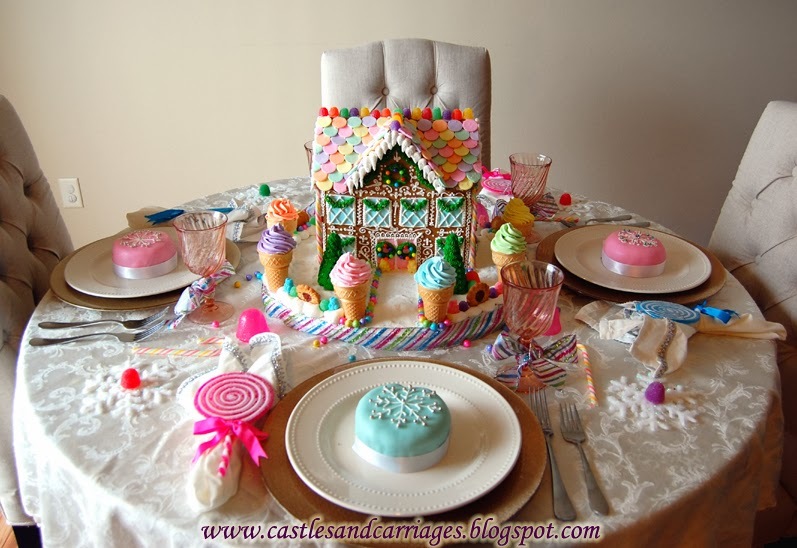 The centerpiece is a real gingerbread house fit for a sugar plum fairy. 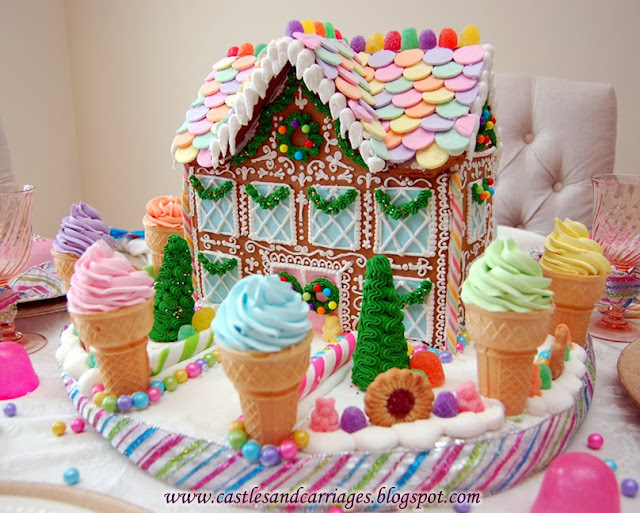 Frosting ice cream cone trees surround the candyland Christmas gingerbread house. Gumdrops line the roof and pastel chocolate sixlets line the walkway. The fence is made of cookies, gumdrops and gummy bears. 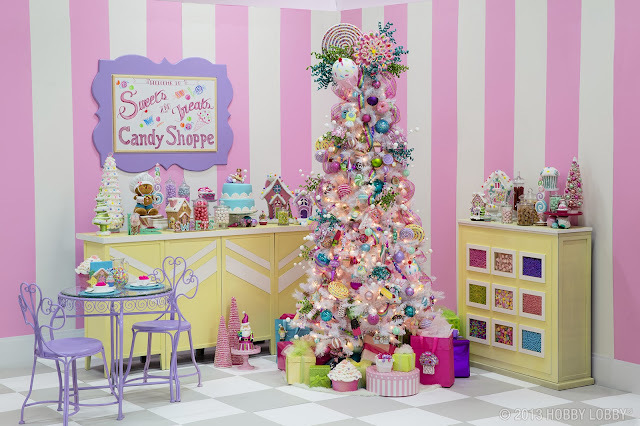 This year I went a little overboard in getting Candyland Christmas decorations for my tree. Instead of purchasing new chargers and plates for this tablescape, I thought to myself, "Why not just use what I already have?" What helped to tie the theme together was my vintage pink Arcoroc water goblets. They were an Ebay find. The sweet pink swirls match perfectly with the Candyland Christmas theme. I tied a festive glittered pink, blue and green striped ribbon around each one. I hope you're having a wonderful holiday season. Please stop by again soon. 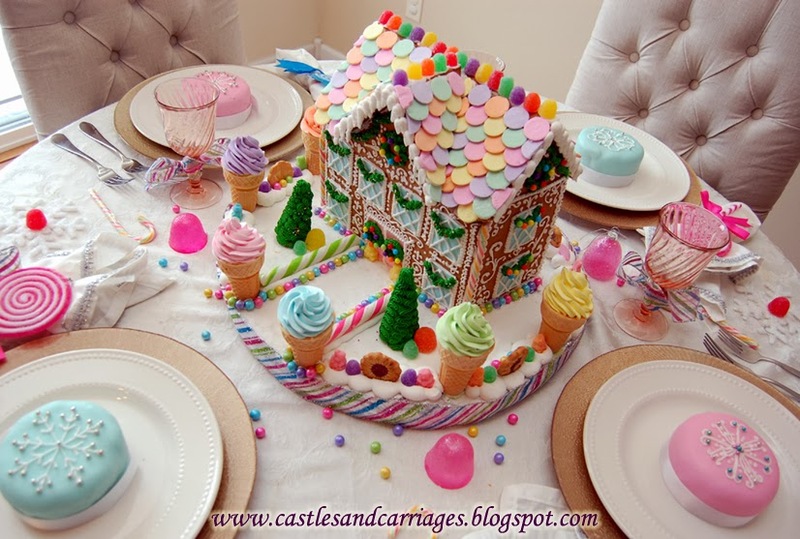 Gingerbread House and Cakes - Made by Me! I am in awe - that is one of the prettiest gingerbread houses ever!! 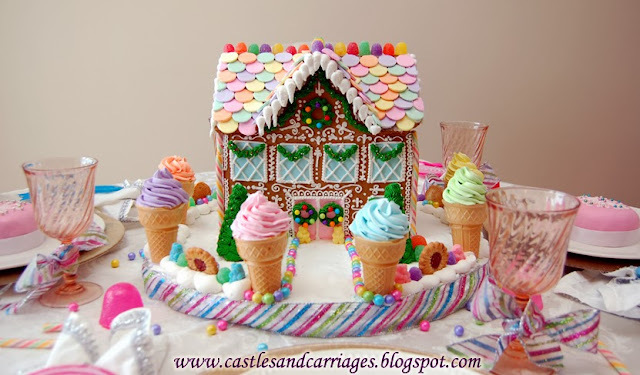 I have Pinterest board devoted to a Gingerbread Christmas and you can bet I am pinning this post - Simply marvelous, oh heck make that simply divine!!! And those little cakes are really just to cute too!! 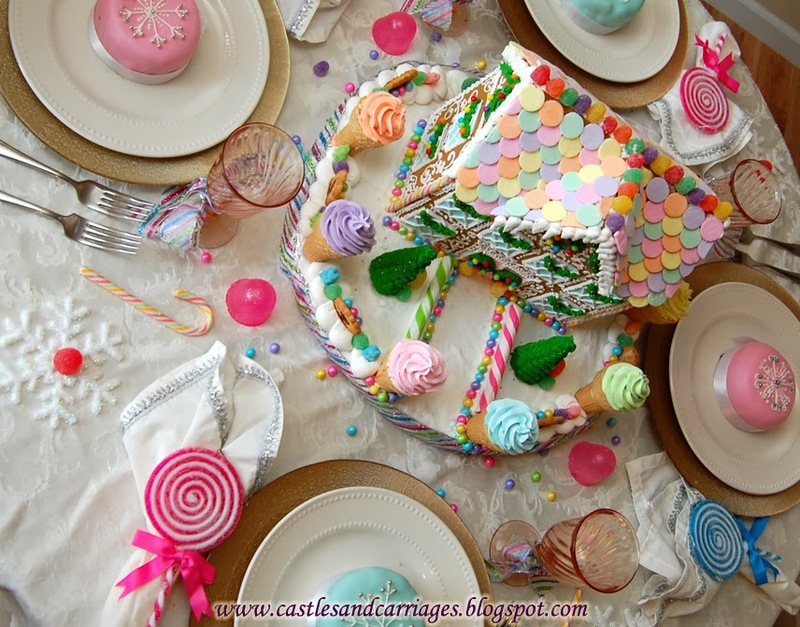 I will be doing a gingerbread man tablescape soon and I am dreading doing the gingerbread house. I think now I will simply use your lovely house as my inspiration!! Thank you so much for sharing! Thank you Candy! 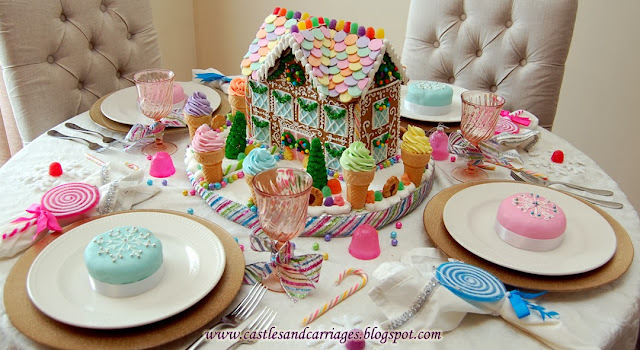 I can't wait to see your gingerbread tablescape :) I don't know if you have a Sam's Club membership but I simply decorated one of the premade houses that I got from there. Last year I made one from scratch and it very labor intensive. This year I cheated a little. Thanks Deb! I love your tablescapes! Thanks for the comment you left on my Visiting Heidelberg post! I love this gingerbread house, especially the ice cream cones! Thank you Brittany! I loved your Heidelberg post! 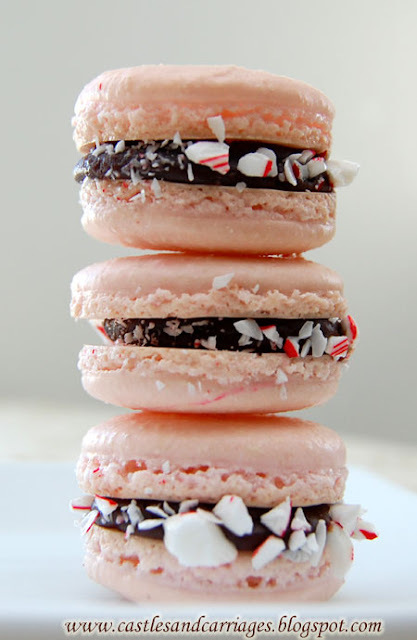 hey there - thanks for visiting my blog - I just checked out a bunch of your Christmas decorating posts and wowzers - some sweet candylicious ideas. Thanks Tina! I definitely had a good time this year decorating! What an amazing table - I can't get over the gingerbread house...absolutely stunning! !